Three new books chronicle our wanton depletion of ocean life. In The Odyssey, Homer depicts the cruel and vindictive nature of the sea through the figure of Poseidon. It’s the sea god who prevents Odysseus from returning home, provoking a severe storm with his trident after Odysseus has blinded his son, Polyphemus. Homer called Poseidon the “shaker of the earth” and the sea, and not insignificantly he was also a fertility spirit who dealt in the ocean’s barrenness. If Poseidon was still a part of our climate, the depletion of the ocean’s fish would surely have earned his wrath, and he would likely wonder how we came to be so blind to this tragedy. More than a decade ago, Mark Kurlansky wrote a book that meticulously traced the collapse of one fish population: the North Atlantic cod. After the explorer John Cabot made his transatlantic voyages to North America in 1497, he observed that the coast of Newfoundland was so thick with cod that schools of them could be scooped up from the sea with weighted baskets. By the mid-1990s, as Kurlansky explains in Cod, Gloucester, Massachusetts, had only about 400 working fishermen, down from 2,000 in the 1950s, when cod were more plentiful. In 1994, having estimated that the current fleet was about twice as large as what the fish stocks could sustain, the National Marine Fisheries Service levied harsh regulations and strict catch quotas on cod fishermen. Two years earlier, the Canadian government had issued a complete moratorium on fishing cod in Newfoundland and Labrador. There were barely any cod left. Since then, there have been stirrings of a slightly revitalized population: the head of the fish conservation group at a Newfoundland university recently returned from a scientific voyage to cautiously report some healthy, promising behavior among cod. Still, it is hard to imagine how the species could return to the level of ubiquity it used to enjoy generations ago, let alone in Cabot’s day. 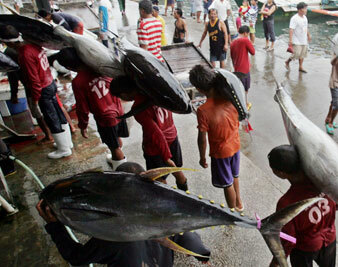 Tuna is another population blighted by overfishing. According to some estimates, commercial fishing of bluefin tuna has reduced populations by as much as 90 percent in the past thirty years. The insatiable sushi market in Japan and increasing popularity of the fish elsewhere is the main cause of the depletion; demand is so intense that a 350-pound bluefin will fetch $120 a pound at Japan’s biggest and most famous fish market, Tsukiji. The World Wildlife Fund called for an immediate closure of all Mediterranean tuna fisheries in the eastern Atlantic a couple of years ago because “Atlantic bluefin tuna stocks risk imminent commercial collapse.” The fishing industry, a business that employs 200 million people and brings in $71 billion a year, has ignored this plea. In today’s global economy, international fishing conglomerates, modern trade policy and fish markets and restaurants willing to pay exorbitant prices form the trident that rules the sea. Fish consumption worldwide is double what it was three decades ago, and while it’s possible to track the volume of fish caught, sold and swallowed, it’s still impossible to determine with a high degree of certainty how much is left swimming free, since there has never been a fish census. But it’s hard to refute the fact that when the average catch dwindles to such a point as to put large sections of the industry out of business, fish populations are shrinking rapidly. As Kurlansky writes in his new book, The Last Fish Tale, “There is one certainty. Something huge–a massive shifting in the natural order of the planet–is occurring in the oceans, and with it will come tremendous biological and social changes.” Yet the mystery of the ocean and the lack of hard data allow vested interests to continue to insist–whether out of sincerity or willful ignorance–that this shift is just a blip on the radar. “Most fishermen, based on centuries of anecdotal family experience, believe that fish are cyclical,” Kurlansky writes. “They disappear for a time and then they come back.” But many experts believe that overfishing has been so costly that stocks will never fully recover. The Food and Agriculture Organization recently reported that 60 percent of the fish species studied by the UN Food and Agriculture Organization are either fully exploited or depleted; one respected scientist estimates that most of the world’s fish stocks will be severely depleted by 2048. And with so few fish for the taking, what will become of the fishermen? In The Last Fish Tale, Kurlansky tries to fathom the mystery by limiting his focus to a single, beleaguered fishing town, Gloucester. The town has most recently attracted attention for the was-it-or-wasn’t-it “pregnancy pact.” But for many years Gloucester was known as an unofficial fishing capital of the Eastern Seaboard: the source of Gorton’s fish sticks, the setting for Sebastian Junger’s The Perfect Storm and the subsequent movie, and the home of a close-knit community of Portuguese and Sicilian immigrants. The Portuguese dominated the Gloucester fishing fleets for the first half of the twentieth century, and more than half of today’s fishermen are Sicilian or descendants of Sicilians. The town was also a settlement for several artist colonies that drew on the ships and ocean for inspiration. Kurlansky is fascinated by ships as well, tracing the evolution of the Gloucester fishing industry from dory fishing (sending men out in rowboats from a larger craft) to the eventual dominance of bottom trawlers (huge vessels that drag cone-shaped nets across the ocean floor and capture and destroy everything in their path). In the old days, Kurlansky tells us, “improved technology was usually directed at increasing catches and not at improving safety.” Between 1830 and 1900, the “golden age of the Gloucester schooner,” 3,800 Gloucester fishermen and 670 Gloucester boats were lost to the ocean; Kurlansky estimates that 10,000 Gloucester fishermen may have perished at sea since the early 1600s. Until the twenty-first century, the community was entirely fish-based; those who didn’t go out on the boats worked on the docks as “lumpers” chopping ice, unloading boats and operating forklifts. Policemen and firefighters worked part-time as lumpers for supplementary income, and children earned pocket change by putting nets in boxes. Though Gloucester was by and large a community of Catholic immigrants (by 1900, 40 percent of the town’s inhabitants were immigrants, a number that continued to swell), they did not look kindly on newcomers. According to Kurlansky, the currents of the fishing crisis can be traced back to ancient fishing practices in the North Sea, when countries that bordered its waters engaged in cutthroat competition to haul in record catches. In England, where “dragging nets was an old idea,” fishermen unsuccessfully petitioned Parliament to ban the practice because it swept up sea life indiscriminately–this in 1376, 300 years after Vikings were thought to have landed in the Gloucester area. Trawling was a major fishing technique in the North Sea by 1774, and it only got worse after that. Kurlansky tells us that bottom trawlers were presciently opposed by Gloucester fishermen in the 1880s because “it was a bad idea, that it took too many fish and would damage the ocean floor.” Because of its astonishing efficiency–trawlers differ in size and capacity, but some are floating factories outfitted with engines of up to 5,000 horsepower and nets a mile long–trawling became the norm in the North Atlantic by the mid-1970s. The New England fishing industry united to support the passage of a law that banned international fishing boats. This cut down on trawling, since it was the foreign conglomerates that, by and large, could afford the huge rigs. But instead of initiating conservation programs at this point (as Iceland and Norway did after establishing exclusive fishing rights in their waters), American fishermen used the opportunity to loot the stocks more than ever. Domestic trawling still occurs, and in the end, as a Gloucester fisherman told Kurlansky, “The technology ruined it. It made fishermen too on-the-money. Fish don’t have a chance.” By “it,” of course, he means the thrill of the hunt; but the technology simultaneously ruined the fish stocks. Capturing the local character is Kurlansky’s strength, and it’s what makes The Last Fish Tale a moving tribute to Gloucester’s disappearing mores. Richard Ellis’s Tuna also pays homage to a fading idol: the Atlantic bluefin tuna. Though the book provides a comprehensive look at yellowfins, skipjack and albacore, it is the bluefin that holds Ellis’s gaze. We quickly learn why: it is the largest, fastest and most threatened variety of the species, all because of the world’s (and especially Japan’s) ever increasing sushi diet. The cruel realities of economics make conservation a Sisyphean exercise: a two-ounce piece of bluefin can cost $75 in a Tokyo sushi restaurant. The liveliest parts of Tuna cover the struggle between the public’s expanding appetite for tuna and the looming reality of dwindling stocks. Bluefin caught on the coast of eastern Canada and New England went for pennies per pound in the 1960s. In the early ’70s the Japanese discovered the huge bluefin there, and the market took off. As Ellis writes, “Fish that had brought forty dollars two years earlier were now worth a thousand. Soon the price of a single ‘giant’ shot up to tens of thousands of dollars. When Atlantic coast fishermen found that they could earn a year’s pay in an afternoon, the uncontrolled slaughter of [what one scientist termed] ‘the cocaine of the sea’ began.” Japan now imports about 60,000 tons of the fish, and the North Atlantic breeding populations are thought to have dwindled about 90 percent over the past two decades. In 1991 Sweden proposed listing the bluefin as endangered because of damage to the stocks; the measure was immediately vetoed by Japan and the United States, both of which have chosen immediate economic interest over the bluefin’s survival. Ellis introduces readers to one solution to this increasing disequilibrium between demand and supply: tuna ranches, where schools of young tuna are captured and fattened in huge pens before being wrestled onto a platform; then a metal spike is driven through their brains. (Alternatively, herds of the fish are corralled into the pen’s corner, where they become the bull’s-eye of a rifle shooter. Remarks Ellis: “‘Shooting fish in a barrel’ indeed.”) Tuna is far more comprehensive than this, though: it also offers a complete summation of all the current scientific knowledge about tuna and a history of sport fishing by Ernest Hemingway and compatriots. Kurlansky’s Cod is a shining example of this genre, and it enjoyed critical accolades–the New York Times hailed its “history filtered through the gills of the fish trade”–and runaway sales. But considering that parts of The Last Fish Tale are warmed-over portions of Cod, it appears that there is no bigger fan of Kurlansky’s work than Kurlansky himself. In some ways, the overlap was inevitable; Gloucester, after all, has made an industry of cod, so a book about the town can’t not be a book about Kurlansky’s own cash cow. But anecdotes made memorable in Cod lose their luster upon retelling (even with a bit more detail) in The Last Fish Tale. One example is the story of Howard Blackburn, a beloved fisherman who rows the corpse of his frozen dory mate 100 miles in a snowstorm, his hands frozen around the oars, positioned just so to be able to continue rowing after losing feeling in his fingers. It certainly is a sobering tale about the toughness of cod fishing and the resilience of the hearty Gloucester breed of fishermen. You can almost understand why Kurlansky recycled it. Except: Blackburn was from Nova Scotia, and he was fishing for halibut in Newfoundland. As much as Kurlansky loves the traditional fisherman and mourns his downfall, Ellis seeks to memorialize the tuna. (Both men drew illustrations of their favored subjects to be included in their books.) Early on, Ellis explains that “when writing about tuna, it is almost impossible to control one’s admiration for these marvelous creatures.” Indeed, far too much of Ellis’s book is ardent stenography of figures and facts about his favored fish, with compliments tucked in at every turn (“the word ‘magnificent’ is often applied to the bluefins, and it is exquisitely applicable”). Though everything you might ever want to know about a tuna is contained here (bluefin have the ability to raise the temperature of their eyes and brain? ), the book suffers from a lack of firsthand reporting. Ellis does visit an Australian tuna farm and stops at the famous Tsukiji fish market in Tokyo (now a required destination for authors writing about tuna and sustainability issues in search of requisite local color). But far more typical of his reporting is this sentence: “A Google search for ‘Japanese restaurants Sydney’ on July 10, 2006, listed seventy-four in that city and its suburbs, so it is reasonable to assume that some of the tuna now being caught in Australian waters remains there.” There’s a lot of summarizing of newspaper articles and scientific reports, cushioned by bursts of adoration, where firsthand reporting would smell fresher. If you set aside Kurlansky’s romantic portrait of the fisherman, is it possible to plumb the mystery of the ocean’s barrenness, or at least understand how to cope with it? This is the approach of Taras Grescoe in Bottomfeeder, a comprehensive, lively and illuminating guide on how “to eat ethically in a world of vanishing seafood.” In ten chapters, Grescoe visits ten locations–from China to Canada–that are ground zero of a particular breed of threatened fish. Though he aims to provide an instruction manual for perplexed seafood lovers who worry that their menus will irrevocably harm the oceans, he does more than that, in fact making sense of ten complicated tales of endangered fish all around the globe. Grescoe’s search for an ethos of sustainable seafood yields a mixed bag of results: after visiting shrimp farms in India that he believes raise “all-you-can-eat antibiotics,” he decides that cheap shrimp is “a meal I could no longer afford.” In Brittany he buys a can of sardines that lists the boat that caught them, the date the catch occurred and the port where they were offloaded. A simple description on the can is, for Grescoe, “a revelation,” and the easiest way to figure out if a can’s contents have been harvested ethically–a simple Google search of the boat or the port can provide a wealth of information. Though Kurlansky is a good anthropologist of fishing communities and Ellis a capable researcher, neither so bluntly captures the pervasiveness of this stubborn and dangerous truth. Nobody wants to change–not the fishermen, not the restaurants that make a killing off toro and not us, the fish-consuming public. Maybe that’s why Grescoe’s book stands a bit above Tuna and The Last Fish Tale: amid the changing climate, technology and trade regulations that have exacerbated the problem of overfishing, he illustrates how human attitudes toward fish have remained the same. It shouldn’t surprise us that the mythologizing of the ocean and fetishization of its mystery has led to a point where one takes it for granted. In seeing the sea for what it is–a malleable, fragile ecosystem and finite natural resource–one can form a new relationship with it, a connection that doesn’t tilt the scales toward our insatiable appetites for more. And as Grescoe suggests, a good way to combat this mystery is with transparency of production and more informative labeling about where, exactly, our fish used to swim and how it was caught. And with so many popular fish populations nearly decimated, we must realize that some seafood is a luxury rather than a guarantee; we simply have to stop eating certain species if they are to recover. Admitting the real cost of our all-you-can-eat shrimp platters is the first step. Only then can we be assured an honest meal–one that just might be available for years to come. Emily BiusoEmily Biuso is on the editorial staff of The New York Times Magazine.